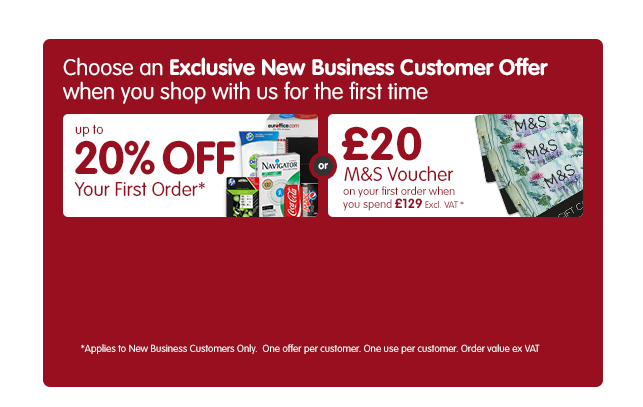 Occasionally we may send out special Euroffice website promotions or discounts via Euroffice emails. These are called e-coupons and promotional codes. How do I use a promotional code or e-coupon? If you would like to claim a special offer or discount which was sent to you, from us via email or displayed on our website, just click on the promotional banner or link. You will be automatically taken to an e-coupon page and the offer will be automatically applied to your basket ready for you when you checkout. If you have received a promotional code from an affiliate supplier or other website, to claim the offer you need to go to the 'My Basket' page and enter the promotional code in the 'Coupon Code' box and then click apply. Any applicable discounts will then be applied to the items in your shopping basket. After you have confirmed and placed your order, we are unable to apply an e-coupon or promotional code post–sale. You can only claim one E-coupon or promotional code per order, with one exception being Shopping Voucher codes, which can only be redeemed max once per week (multiple orders within the same week will receive max one Shopping Voucher in total). You may need to log into your Euroffice account or register as a new customer before you place an order using your e-coupon or promotional code. Register or login now. If you are still unable to use your promotional code, please contact us online or call our Customer Care Team on 0800 316 3876, Monday to Friday 9am – 5:30pm.